How to Seal a Fireplace Surround. If you have black fireplace soot staining the brick around your fireplace then it may be time to seal the fireplace surround. As the wood burns, the heat and soot rises and escapes through gaps that exist between the fireplace surround and the brick. If you seal these gaps, you can have soot-free brick. Perform an inspection of the fireplace surround and brick when the fireplace has been cool for a number of days, or in the summer season when you typically don't use the fireplace. Stick your head into the fireplace and look up towards the top of the fireplace surround and the brick. If you see a gap, then you need to seal the fireplace surround to prevent soot from escaping up and out of this gap, causing soot staining on your fireplace brick above the fireplace surround. Turn to the devil and purchase some Red Devil Fireplace and Stove Repair Caulk. This caulk comes black in color, sets hard and will seal air leaks in flues and fill those nasty cracks in wood burning stoves and the interiors of natural wood burning fireplaces; it's heat resistant. Load a caulk gun with Red Devil Fireplace and Stove Repair Caulk. Go from the inside and look up towards the top of the fireplace surround and the brick to seal any gaps that you see with a generous amount of this silicate cement. Use your finger to spread the silicate bead if necessary to create a tight seal between the brick and the fireplace surround to prevent soot from rising out of this gap to stain your brick. 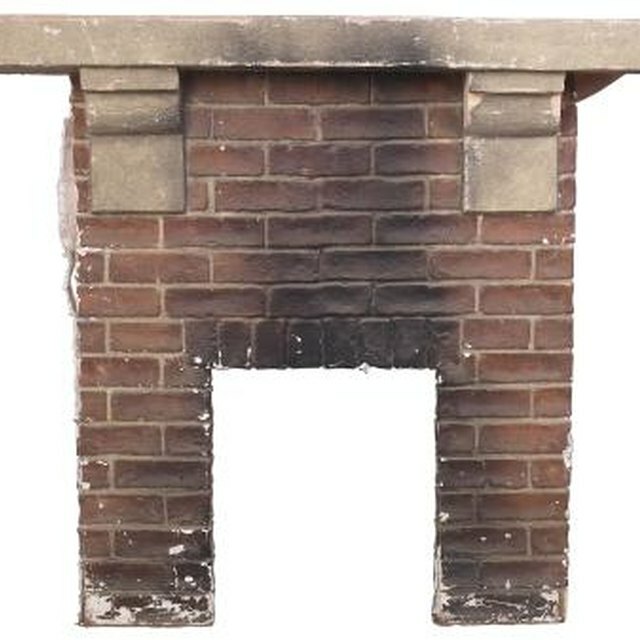 Check for any side gaps along the fireplace surround and brick to seal them as well. If you don't seal the sides, soot will escape through these gaps to create new soot stains on the brick, on the sides of the fireplace surrounds. Allow the proper curing time for this silicate cement to set up to create a solid barrier between the fireplace brick and the installed fireplace surround to prevent soot from escaping through the gaps. Buy Red Devil Fireplace Caulk From Ace Hardware.